I was very glad to get some beautiful spinach sold at a bargain price. 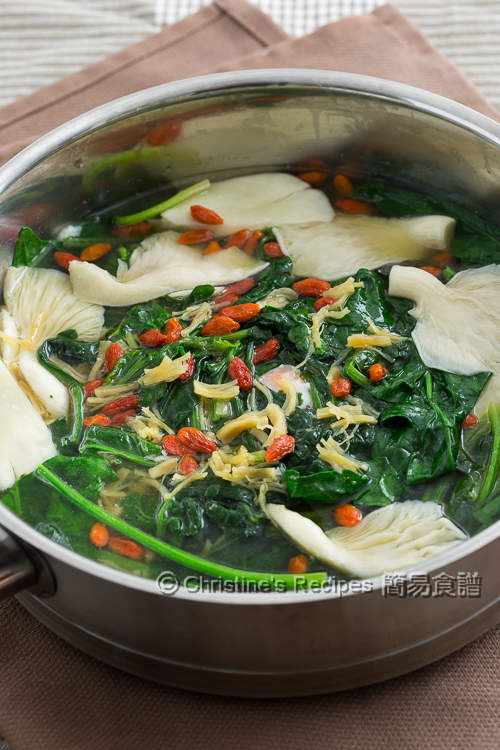 One of the best ways of cooking spinach is making soup. This no-brainer soup only takes 10 minutes to make. Nothing can be easier. How about the taste? It all depends on the soup base you choose. Chicken broth is a good choice, homemade or your favourite brand. If you want to use vegetable soup base, it’ll work too. The umami taste of the dried scallop will make your soup more delicious. The highlight is the soft boiled egg. Not only the runny egg yolk in the just-cooked egg white attracts your eye balls, but also it entertains your taste buds. Rinse the spinach and drain well. Roughly chopped. Set aside. Soak the dried scallops in water until softened. Use your hand to pull the scallop meat apart into thin strips. 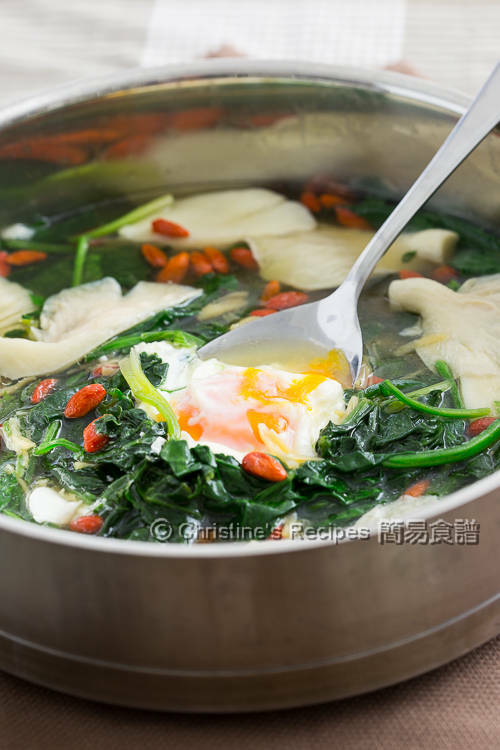 In a large pot, bring the broth to a boil over medium-high heat. Add a little of oil, garlic, spinach, oyster mushroom. Crack the egg and place into a little bowl. 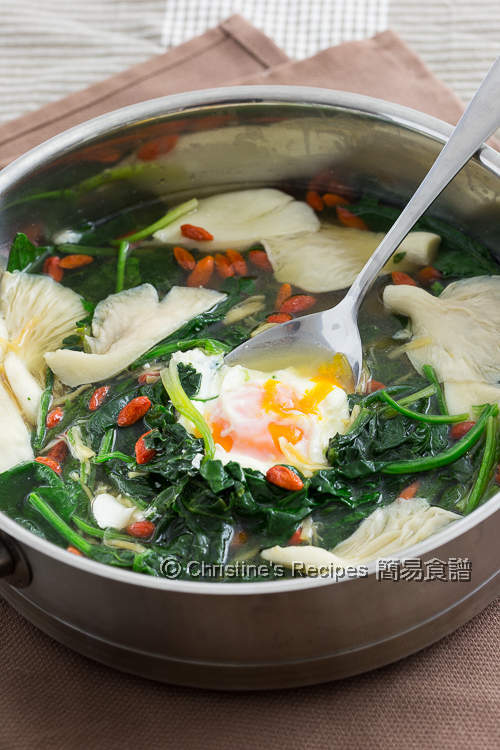 Carefully lower the egg into the middle of the pot. 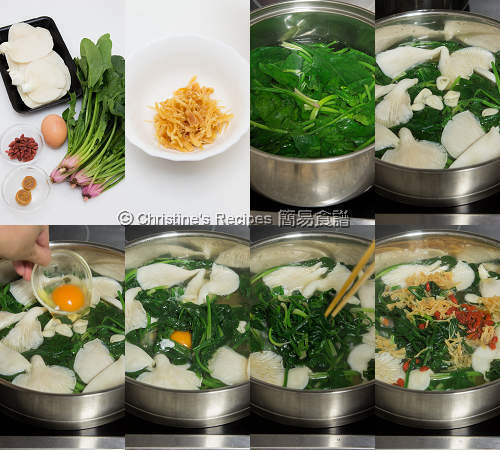 Cover with some spinach. Reduce the heat to low and simmer for about 2 to 3 minutes, depending on how you like it to be cooked. Sprinkle the dried scallop and goji on top. Cook further half of a minute. Done. Season with salt if needed. The cooking time of a shelled egg is much shorter. Beware it will turn hard very quickly. You may turn off the heat after adding the egg. Let it soak in the hot soup and get cooked to your liking. As the power of every stove is very different, please adjust your stove power level and the amount of broth accordingly. Don’t ever let the soup dry up. Love homemade food like this...so fresh and good!